Two weeks in Chile. I don't know where to start. There is so much to talk about and so many pictures. We had such a good time meeting all the family and trying all the good food. Too much to write so I am going to sum things up and share a few of my thoughts of Chile. A few words FYI: Tia=aunt, Tio=uncle, Abuela=Grandma, Vina Del Mar=where we stayed. Abuela Lela is Cisco's dad's mom and who we were staying with. Abuela Elsa is Cisco's mom's mom. - my first international flight and first time with a passport! -stray dogs everywhere!!!! i wanted to feed them all. Perrito!! -Amazing dinners every day of the week. Lela really knows how to put on a presentation. Every night had some amazing meal, a yummy salad, juice, and fresh bread. -bus rides in Vina = rollercoaster rides. The buses are more like taxi's than buses. There are a few normal bus stops but half the time you just hold your hand out like you are hailing a taxi and they pull over and let you in. -first time tasting coffee.... sort of. Everyone in Chile drinks something hot at night and since they are all members, there is a caffeine free coffee substitute that the church encourages its members to drink instead. Caffee con Leche. with enough milk and sugar it was pretty good! -Chile reminds me of California. A lot. -The beach at Algarrobo is amazing!! We wanted to rent a beach house there they were so cute! -music playing on the buses is mostly in English. and there are several of the same popular songs that are played here but most of the songs are the songs i loved in the 8th and 9th grade! haha i loved it. -there were 3 small earthquakes while we were there... and i only felt one of them. I was so excited about feeling my first earthquake and i never even knew what was going on! disappointing. The first one was really early in the morning before we had woken up and i said to Cisco "stop moving, you are shaking the bed" then the windows rattled a little and he informed me that i had just felt an earthquake. The second one was while we were in Sunday School at church. All of a sudden everyone starts chattering (in Spanish of course so I had no idea what was going on). After Sunday School, Cisco asked if i felt the earthquake and my response was "What earthquake?!". The last earthquake was around 40 seconds long, that is long for an earthquake and I STILL didn't feel a thing. We were getting ready for bed and I told Cisco it wasn't an earthquake, it was just him moving. Guess I was wrong. So those are my exciting first experiences with earthquakes. -Tio Pancho (aka Uncle Francisco) has the cutest yellow house. I love it! -Pan con Palta= Bread with Avocado. Delicious. I love that all the little kids there come up and ask for "Pan con palta" or "pan con queso". All the kids love avocado. -We saw Iron Man in the theater there (in English with Spanish subtitles) and when the movie was over we forgot we were in Chile. We were expecting to walk out and be in a Utah parking lot. -We went to the mall to try and go shopping but Chile is in the middle of their Fall so they have winter clothes out. Instead we went to the yummiest restaurant called Domino, not like the pizza place. People are always asking me what Chilean food is and i've never really known what to say. The food we eat at his moms is so similiar to what I grew up with, I didn't know what was Chilean and what was just something they ate when they got here. 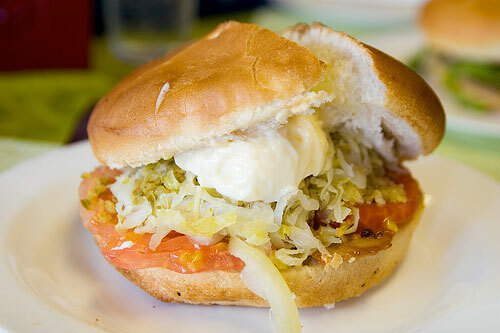 If you were to say hamburgers are a staple American food because all sorts of places have some version of it, then Chilean food would have to be sandwhiches and completo's. The sandwiches that are everywhere are the Churrasco Palta and the Chacarero. I can't do these justice trying to describe them but this little article does a great job of showing a few of the food staples in Chile. 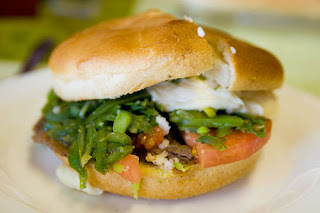 Here are some of the pictures i borrowed from their website since i forgot to take pictures of some of our favorite sandwiches. Chacarero. Fresh green beans and a hearty bread. So delicious! Completo Italiano. 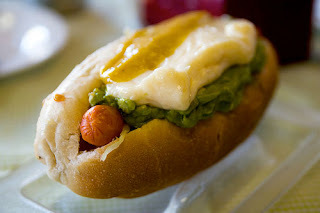 Hot dog with smashed avocado, tomatoes, mayonnaise, ketchup, maybe some mustard. Actually a delicious combination. And the bun isn't the fluffy American hot dog bun that practically dissolves in your mouth. This is GOOD bread. enough to hold in all the delicousness. So those are some basic Chilean food staples. They also eat lots of vegetables like tomatoes and celery with olive oil and salt. so good. Chilean meals also mean juice and fresh juice and bread and coke, lots of Coka Cola. Coke is different there. It is sweater and not as carbonated, therefore it is better. - all the museums were closed because of the earthquake so we only got to go to one room that was open about some of the Easter Island stuff. -We went to Santiago for 2 days and it was a lot of fun. We did some great shopping there and got to walk around the temple grounds. There are so many trees lining all of the streets. It was beautiful. -Driving down the coast is a good way to spend a day. I loved seeing all the buildings and restaraunts right on the ocean. Ok i am warn out and sick of typing. 2 weeks is too much to tell everything fun that happened and everything I liked. Moral of the story: Chile was fun and we loved it. Maybe tomorrow i will tell some more of the funny stories of our adventures in Chile. There are quite a few of them. Thats it for now! Enjoy our pictures.